in Social Media with tags buzzfeed, Facebook, GIFs, Glimpse, instagram, Pinterest, seo, Snapchat, social media week, storytelling, twitter, ugc, urban outfitters, Vine, visual marketing Both comments and trackbacks are closed. During Social Media Week, I had the opportunity to attend the panel, “Reading is No Longer Fundamental: the Shift to Visual Vocabulary.” The talk centered on the evolution of visual content on the web, and how image-based content is being consumed and shared by consumers and brands. The panel was moderated by the Huffington Post’s Bianca Bosker with speakers: Apu Gupta, CEO of Curalate; Will Palley, Trends Strategist from JWT and Craig Hepburn, Global Head of Digital at Nokia. The session’s key takeaway: Visual content is taking over the web. Per Palley, 40 percent of the Internet is comprised of images and 70 percent of social content is visual. As social platforms, media channels and brand to consumer engagement evolve to cater to this trend, marketers are shifting their strategies to capture consumer attention and interest. Below is a recap of the pros and cons of this marked push toward visual content as they pertain to marketers’ ambitions to connect with people across the web. Pro: Visual content is a key fixture across most web and social channels. Consumer-to-consumer communication has evolved from e-mails and texts to Snapchats, emojis and GIFs. In vein with this trend, consumer-to-brand engagement is also becoming more about social content and UGC, which allows for richer engagement on social platforms. Facebook and Twitter have re-designed their layouts to compete with the likes of Instagram, Vine, Pinterest, Buzzfeed and Snapchat. This affords branded visual content with even more opportunity to shine. 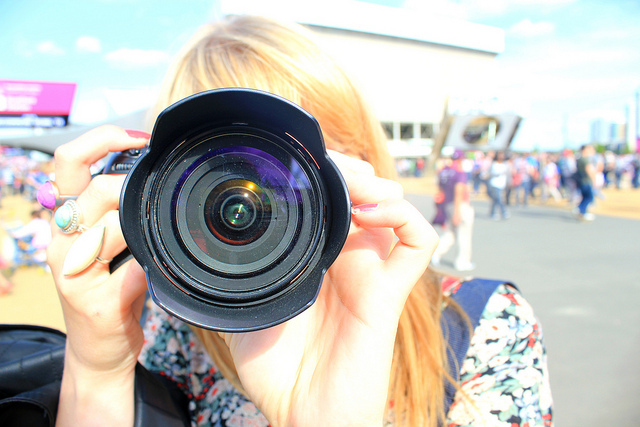 Pro: UGC allows brands to infuse fans in their storytelling. Brands are increasingly curating content, instead of solely creating it themselves. This opens the door for authentic engagement and loyal consumers – in addition to tapping influencers and content creators via formalized partnerships. Urban Outfitters, for example, recently started curating Instagram images of fans wearing their merchandise. Brands are benefiting from the surge in adoption of visual marketing, as humans process visuals 60,000 times faster than text (Source: 3M Corporation). Con: Images can be superficial. As consumers continue to digest and share visuals on a regular basis, there is a possibility that over-sharing could lead to superficial marketing (that is, sharing for the sake of sharing), whether it is self-promotion or brand advertising. A new dating app, Glimpse, is allowing users to create their profiles using only several photos from their Instagram account. While this helps tell the story, it might not have enough context to be effective. Media outlets like Buzzfeed depend strongly on GIFs and images to tell a story, which can be taken out of context without the proper caption. Con: Much of the web remains text-based. Text is still important when understanding the context of the visual. For example, we advise marketers on Pinterest to inject SEO best practices into their strategies in order to make their content more relevant and discoverable for searchers. The web was built on the foundation of text. Although the engines are evolving to capture more social and multimedia content, text is still paramount when it comes to SEO and SEM campaigns. Social listening around visual content is a difficult task for brands. For instance, there may be missed opportunities to track consumers who Instagrammed a product but did not mention it in the copy. Brands are still primarily listening and advertising on the web using text. So are visuals trumping copy? Not yet. Rest assured the web world will still need story tellers that can combine both copy and visuals. Brands that are cognizant of visual engagement and its possibilities will be well-positioned to reach consumers in the ways they are already sharing and communicating.